This is a spectacular plant if you can manage to grow it. I am not good at it and rarely offer it for sale. The first time I saw dombeyi it was growing over the top of shrubs like a vine at Diggers in Dromana. Having seen it growing in such profusion it is rather annoying that it doesn’t seem to like my climate. Even where it does grow reasonably around the coast it tends to suffer from spider mite. 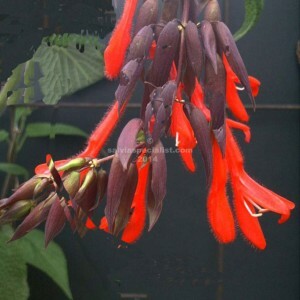 I had beginner’s luck with flowering this salvia and have never grown it well in the years since. It grows like a spindly vine with the most amazing finger length red flowers coming out of maroon pointed calyces in spring. It comes from high up in the Andes where it flowers so much they make garlands of the flowers and use them in processions etc.